Gommateshwara Statue is a 57-foot (17 m) high monolithic statue located at Shravanbelagola in the Indian state of Karnataka. The statue is dedicated to the Jain god Bahubali. 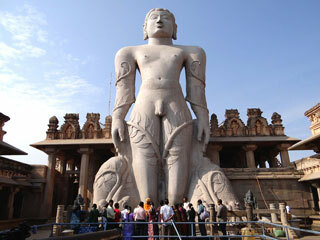 It was built in around 983 A.D. and is one of the largest free standing statues in the world. The construction of the statue was commissioned by the Ganga dynasty minister and commander, Chavundaraya. Neighboring areas have Jain temples known as basadis and several images of the Tirthankaras. This article uses material from the Wikipedia article "Gommateshwara Statue", which is released under the Creative Commons Attribution-Share-Alike 3.0 License.